This time I used one of my very own Digi Stamps I am now offering over at Shelley Bean Stamps! If you like this design, go and take a peek at it and other stamps that I have now available. 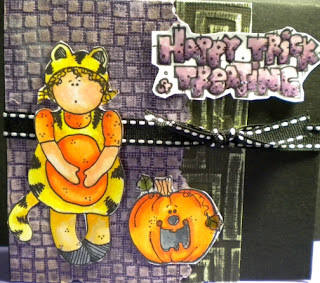 Stay tuned because I will be offering something fun this weekend from my stamp site in Nicole's big blow-out Halloween Blog Hop this weekend at Canadian Nickel Scrap'n. Now back to details about the card! The pumkpin Stamp was from DJ Inkers, and the verse stamp from D.O.T's. And of course, as I already mentioned, the little trick or treater is my own design. I used Coredinations paper and embossed the heck out of it with Cuttlebug folders Traffic Jam and Tiny Mosiacs. It's as simple as that! Not too early for Halloween! This is really cute! Looking forward to this weekend! I'm with Nicole..it's never to early for Halloween. 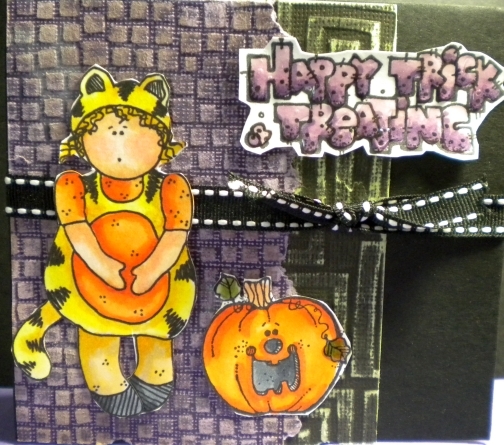 You did a great job with your card, and I am sooo looking forward to the blog hop this weekend. This card is adorable! Love what youve been doing lately. on your next halloween card can you tell us what colors you use for the oranges and the purple to blacks on the lettering. THanks!